Salt ponds are one of best places, day or night, for beginners to start their fly fishing endeavors for striped bass. They have diverse bait options and are an easily understood area for a beginner. Many fly fishermen reading this probably have a small- to medium-sized salt pond at which they fish the outlet on a dropping tide during the day for schoolies. In your head, this is a schoolie spot, but what if I told you that you’re just approaching it the wrong way for targeting big fish? My favorite salt pond near my house has fly fishermen and light-tackle spin guys there frequently. Sometimes, if the sunrise looks like it might be epic and I am fishing on a weekend instead of before work, I will stay well past my normal stop fishing time of 5:30 am and will hang out until 6 to 6:30 am. Will put on a small gurgler and see if I can raise a few schoolies on topwater because topwater is always exciting while I wait for some awesome picture shots to reveal themselves. During that 5:30 to 6:30 am window, new guys will show up and politely ask if they can fish. I will say, “Go right ahead. I am pretty much done fishing anyways”. Often they will remark it’s a great spot for schoolies, and my response is: “Well, you are showing up three hours later than you need to, if you want a keeper”. To this day I have yet to see one of them show up when I am fishing 2 to 5 am. I am not saying they would have caught tons of big fish and, in fact, they probably caught way more striped bass than I did that same day. 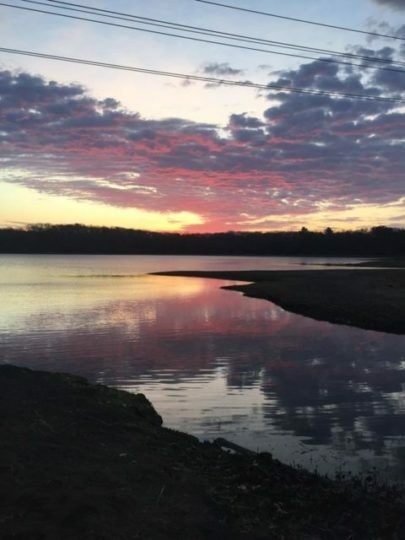 A good night at a salt pond throwing large flies will yield two to three fish in the 30 inches or larger bracket and another three to five fish in the mid to upper 20″ range. A more normal success rate at night with big flies is a few fish in the 28″ to 34″ range. 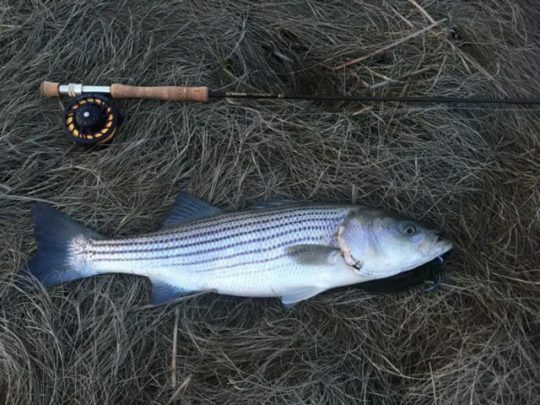 A good daytime falling tide using standard striper flies might yield 15 to 35 school stripers, with a few 23″ to 27″ fish mixed in, but most fish will be 16″ to 20″, with a fish over 30″ being very rare. So, a daylight trip is probably going to yield more fish caught than a dedicated night trip hunting big fish, but, out of my all my daylight trips to fish salt ponds, I have personally never caught a bass over 27′ except one time. On that one exception, I stumbled onto a silverside spawning event and bait density was insane, creating blitz conditions in the pond’s outflow as disoriented bait fish were getting sucked out of the pond by the falling tide. In general, I have found that the incoming tide is usually the best tide window for catching larger bass. Depending on the pond, the window varies because the tide may need to reach a certain level to start moving water into the pond. Outgoing at night tends to produce higher numbers of fish, but a smaller average size than the incoming tide bite. 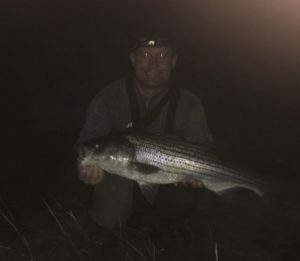 However, at night the size of stripers is usually 50% better than what I catch in the same place on the drop in daylight. One way to set yourself up to have the best outing is to find a salt pond that only starts to fill up in the last hour or two hours of the incoming tide. Look for a night where high tide is half an hour before listed sunrise time. Show up two hours before high tide and fish the night incoming tide for bigger fish, but if you strike out in the dark, you will get a shot to target smaller fish on the first two hours of the outgoing tide as the sun is coming up. I will often do this myself as many big fish hunting parties end in a skunk so its nice to bend the rod before heading to work. Months like June where first light starts before 5 am allow me to fish both the night and first-light bite windows before heading to work. The other mistake I tend to see is that anglers get overly focused on the inlet/outlet area of the salt pond. I have found that bigger fish tend to actively search the pond for larger baits in the dark such as American eels. So, my strategy is always to fish the inlet as the tide starts breaching slope and creating that peak current window, but after 30 minutes or so, I will start fishing my way progressively deeper into the salt pond. I then will fish my way back to the inlet and fish the very end of the incoming tide at the inlet. 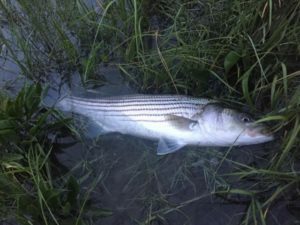 As mentioned in the previous Night Striper Fishing–Part 3 blog post, using your hearing frequently is a good way to help identify areas where stripers are actively feeding in a salt pond. These areas are usually quiet and have a calm surface, so stalking fish by sound and spotting the surface activity by moonlight or afterglow reflection on waters surface will help you target feeding fish in a large area. I don’t use poppers at night very often, but one way I like to use them is at slack tide at salt ponds. I fish them with one loud or two back-to-back hard pops and then wait 60 to 90 seconds before popping them again. My poppers have very long black saddles or dragon tails off the back that have a lot of movement when relatively still. I believe bass think it’s an eel that was attacked by another striper and is now stunned/injured near the surface. One other observation is that, on the drop, usually large schoolies or a few keepers will take up feeding stations out the outflow for the higher stages of the drop where there are better current and more holding water. However, my biggest fish caught on the drop are usually solo fish in the 30″ to 34″ class that have all come at a minimum holding water point during the drop. In the dark, they seem comfortable coming into the very skinny water and, at this point, most of the bay and mudflats are exposed. 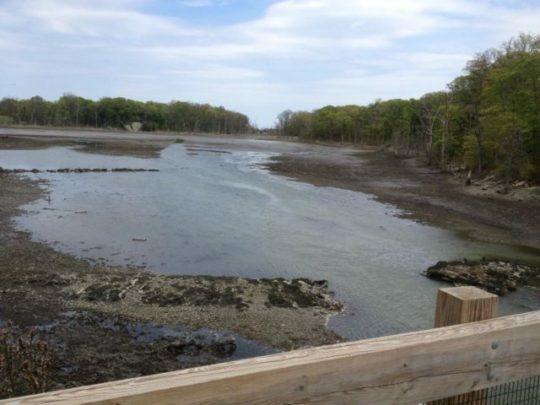 But, the salt pond outflow will have a very small falls-like effect, and the channel snaking out to the main channel will have enough water for a big fish to still come in from the main channel. The bait gets disoriented by the falls, and a solo large bass can be right at the base of turbulent water. Also, the small bait gets packed into a very small area and I find this super density of bait brings in the bigger fish hunting solo. In general, I don’t catch truly huge fish over 40″ in salt ponds, but there are two exceptions to this rule. First, if the salt pond has a freshwater source, it may also get a small run of herring. Any salt pond with a herring run can produce a 40″ striper during the adult herring spawning runs. The second exception to this rule is any isolated salt pond that has direct access to the main ocean. In these scenarios, really big fish will move into the salt ponds to feed only on very extreme high tides at night. For example, say the normal high tide range is eight to nine feet, but on a new moon cycle, you see three nights where high tide is going to approach the 11′ to 12′. That is a potential for a big fish to come in and feed on the food density that is usually inaccessible or too skinny for them to feel comfortable feeding there. Recon the area leading up to the salt pond for channel structure. 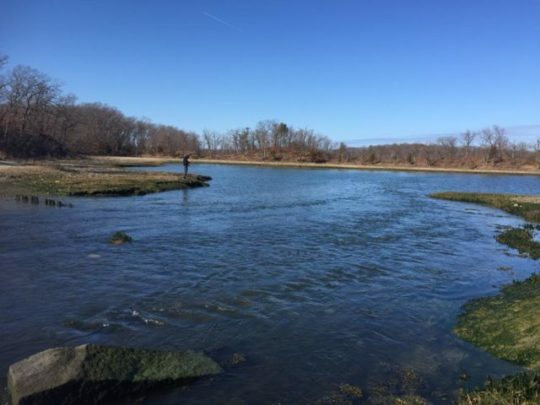 It is important to figure out what levels of water on incoming ties allow striped bass to move up to the entrance to the salt pond and breach the entrance. Look for key pieces of structure at the inlet that would provide an ideal ambush location for a solo large fish. Examples are a piece of sod bank that fell off and makes a current break at the base of undercut sod bank, one large rock in the middle of the current flow, a small row of old dock pilings, or a scour hole behind a mussel bed just inside a pond inlet. Identify any shellfish bed areas inside the main pond. These areas attract marine worms and green crabs and they in turn attract stripers. If you see any, make sure they are part of your fishing rotation through the pond during the incoming tide. Large crab flies can be the ticket to higher quality stripers near these beds at night, but you need ponds with good water quality and not a lot of mung or weeds to fish crabs along bottom effectively. I recommend nine-to-12 inch herring fly patterns, like a hollow fleye, beast fleye or a conomo special. There are three approaches that work well. At the inlet, you can fish these on a swing in the current. My preference is after swinging them across the inlet current, I like to retrieve them tight to the sod bank, pushing a wake on the surface like a spooked herring. Inside the pond, try a variety of retrieves from a surface waking bulge, an erratic below surface retrieve, and a slow continuous near bottom retrieve. The other fly you should have is an eel fly in the 12″ range. Rich Murphy’s RM Rattlesnake and RM Quarter Moon Special are good fly pattern options. The Quarter Moon Special is a surface fly that is waked/skated across current on the swing or retrieved as slowly as possible across the main pond surface, but fast enough to create a surface wake. The RM Rattlesnake I like to fish near the bottom on a short fast strip retrieve to activate rattles or on a swing where I hold the fly line during the swing and induce six-inch pulls and releases to activate rattles during the swing. Rich mentions in his book that he likes to fish the rattlesnake along sod banks animating the fly with five strips followed by a long pause and says most hits occur on the initiation of the strip immediately after the long pause. I somehow missed this and caught it reading the book again over the winter so will test this retrieve out as well. You also need green crab flies, preferably with one or two small rattles in them. Move the fly with two short fast strips to activate rattle then let it sit 10 to 30 seconds before doing two more strips. This painfully slow retrieve works best. Depending on the depth of the pond I may switch to a full sinking line to fish this approach, or you will need a much longer leader if using a floating line with a very heavily weighted crab fly. An intermediate line will really waste your time as it will take too long to get to the bottom. I don’t recommend it for crabs. Lastly, you should have silverside imitations for daylight schoolie fishing and a worm fly in case you happen on a worm spawning event. In the event of a silverside or worm spawn, I recommend you use a two-fly rig with the worm or silverside as the lead dropper fly and the big herring fly as the trailing fly. Fish this fly with the same retrieves as the herring fly. When fishing for schoolies at first light, I like to swing the fly or dead drift it under an indicator on the current outflow. Also, casting into the edges of current flow and retrieving the fly back through slack water eddies can produce well. I prefer a floating line with a longer leader; that way, I can fish a deciever high in the water column and, if fish feedback is poor, switch to a clouser to get closer to bottom. As mentioned earlier I like a big popper for fishing any high slack windows in the dark. I fish them with one loud or two back-to-back hard pops then wait 60 to 90 seconds before popping them again. This retrieve is even slower than the crab retrieves and takes a lot of discipline.